Jewel will MAYBE NOT tour Australia!! Re: Jewel will tour Australia!! 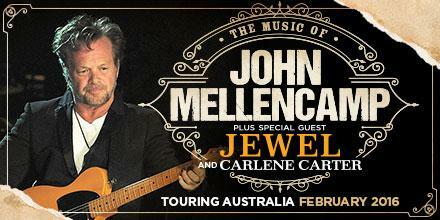 Australian audiences can see John Mellencamp during a seven-date tour of Australia in February 2016, supported by a special international guest, singer and songwriter Jewel. The US musician – whose extraordinary list of honours includes a 2001 Billboard Century Award, the Woody Guthrie Award in 2004, a Grammy Award and the Americana Music Association Lifetime Achievement Award for Songwriting – was inducted into the Rock And Roll Hall of Fame in 2008. In 2012 he was awarded the John Steinbeck Award, which is given to artists who capture "the spirit of Steinbeck's empathy, commitment to democratic values, and belief in the dignity of the common man”. Indiana-born John Mellencamp burst on to the Australian scene in 1979 with his first hit, I Need a Lover. His enduring success has continued throughout 40 years of playing and touring and Mellencamp is well known to Aussie audiences for songs, such as Jack & Diane, Paper in Fire, Small Town, Cherry Bomb and R.O.C.K in the USA. Indeed, Australia has played an important role in Mellencamp’s success, with seven top 20 hits and 10 top 20 albums climbing the local charts. He has sold more than 1.5 million albums in Australia and his single I Need A Lover was top five in the local charts – the best result in the world – a fact he acknowledged in his last tour Down Under in 2008. Two albums, Scarecrow (1985) and Lonesome Jubilee (1987), have gone five-times platinum in Australia, while The Best That I Could Do: 1978-1988 is triple platinum. Mellencamp also created the benefit concert Farm Aid, with fellow music icons Willie Nelson and Neil Young. The fundraiser for American farmers recently celebrated its 30th anniversary. Mellencamp recently completed the 80-date Plain Spoken tour of North America, earning rave reviews for what was described as “one of the most electrifying shows in the business”, blending a catalogue of powerful anthems and popular hits. As one Australian reviewer summed it up in 2008: “Mellencamp’s songs are iconic enough to do all the talking, and performing, for him”. His tour was a “a perfectly selected, weighted and delivered set from an undeniable rock legend”. Mellencamp will be supported by Alaskan singer-songwriter Jewel, performing songs from her extensive catalogue and latest release Picking Up the Pieces. Since her debut Pieces of You in 1995 which featured the massive hit Who Will Save your Soul, Jewel has established herself as one of the most successful musicians of her generation with powerful mentors including Bob Dylan, Merle Haggard and Neil Young. A storyteller at heart, Jewel also has written her memoir, Never Broken, authored two children’s books, and a pair of successful children’s albums. Cool news for Australian fans! I wonder if this will turn into a world tour. Hey, there, KC - good to see you around! Yeah, this is pretty crazy considering we were all p convinced Jewel wouldn't play opening fiddle to a bigger act again, but looks like we were wrong! It would be amazing if she could hitch her star to a European tour, too. Wow - these are big venues! 14,280 capacity for the one in Melbourne ... 21,000 for the one in Sydney. Only 9500 for the one in Brisbane, though. An absurdly high 70,000 for Adelaide. Doubt that one will be sold out! OMG Jewel's finally coming to Australia! I'm finally going to see her live! I hope there's some kind of meet and greet. I'm a little bit meh about Jewel being the special guest, how do these things normally work? Will she be the opening act or do they do equal length set lists? If she's the opening act I'd expect him to bring her out for a song or few. I kind of only want to go for her set lol. I'm tempted to go to the Canberra and Hunter Valley shows too. Here's hoping Jewel feels the love and comes back for a full solo tour. This will mark her first international concert since the 0304 era right?? I'm so happy for you!! It's about time she made it down under!! Nice! She's getting worldly again. I hope that Jewel adds some solo shows after the Mellencamp tour is done. I doubt but it would be nice if she did a couple of smaller venues in Sydney like the Enmore Theatre or even the Opera House again. Matt - did you get your tickets? Yes I did Jessica! Front row was like $500 so I didn't do that. I got some pretty good seats though in section G. I just hope Jewel's on for a decent amount of time. Re: Jewel will MAYBE NOT tour Australia!! American heartland rocker John Mellencamp has rescheduled his Australian tour. Originally due to kick off at Sandalford Estate, Swan Valley on February 6, the Rock and Roll Hall of Fame inductee will now start at HBF Stadium, Mount Claremont on June 14. Tickets already purchased remain valid for the new date. Ticketek will contact ticket holders with full details. Alaskan songbird Jewel and country music royalty Carlene Carter were announced as supports for the Sandalford concert, but have not been confirmed for the new show. No reason has been given for the reschedule. Poor Oz. It's been over 10 years since she's been there. Feel pretty sorry for the Australian fans - so close, but yet so far. Really thought yesterday's new tour dates would have a couple of make-up dates included, but apparently not. Back to reality, by the looks of it! The emoji at the end of her tweet, leads me to believe that she may be planning her own dates. She's replying to someone saying she looks down on Oz or some BS. Jewel has the same trouble spelling Mellencamp's name I do! Bummer. She's not joining. I need to get rid of my ticket now. I'm sort of hoping too that that wink emoji is because solo shows are in the works.